I have 2018 all electric Ventana 4311. I would like to have schematics covering all valves and water lines for the plumbing system and similar for all electrical lines, switches, circuit modules for the coach electrical system. For example, the info that I was provided did not define the operation of the patio switches. If you know where such information can be obtained, I would certainly appreciate the direction. As I understand from Newmar owners, this information was always provided in the past but they have discontinued this practice. Initially, I experienced an electrical problem and getting useful information was extremely difficult. I worry about encountering a similar problem years from now when info may be even more difficult to obtain. Welcome to the forum and irv2. Link to help you get around irv2. With a new coach did you have a PDI and explaiation on how everything should work? Here is information you need to know which will require a lot of reading. If you have COMFORT DRIVE you need this.-- If a question for Ken use this link. All the links below in my signature have info for your Newmar. You have a lot to do we are here for any help you need and the Handicap Forum can help you also. I agree it would be really nice to have all the drawings. It's not like it's secret proprietary information. The generic info book with the plastic spiral binding was about worthless. When we had our '00 and '02 DSDP's I found I didn't really need the schematics. With the present Country Coach I'd be lost without them. Luckily they are all in the owners file box. Good luck. Not going to happen until the majority of Newmar owners demand the documentation. To my surprise there appear to be a significant number of Newmar owners who don't seem to care that Newmar withholds documentation from owners. Somehow they don't seem to be able to connect the dots between the cost and convenience of ownership the absence of detailed documentation. See the Right to Repair thread for more details. I don't have all the plumbing drawings, but I have all the electrical. I don't recall if I got it from Newgle site or if they were printed and in my case of manuals when I took delivery. I am going to keep hammering on this issue until we get some relief. Newmar stubbornly refuses to release coach schematic diagrams to owners. Here is what fellow forum owners and I have been told about Newmar coach schematic diagrams: "they don't exist", "they are not available to me", "Newmar uses a free wiring technique so their are no schematics", "they are in another building where I don't work" and finally "engineering will not share them with me". LET'S NOT BE CONFUSED HERE. THESE DOCUMENTS DO EXIST. THIS IS SIMPLY A LAME EFFORT TO "PROTECT" WHAT THEY TERM AS THEIR INTELLECTUAL PROPERTY. THIS IS FOOLISH AS ANY UNDERGRADUATE ELECTRICAL ENGINEERING STUDENT COULD REVERSE ENGINEER A COACHES ELECTRICAL SYSTEM GIVEN TIME AND ACCESS TO THE COACH. A TRIVAL EXERCISE GIVEN ENOUGH TIME AND THE WILL TO TAKE A COACH APART. Just so there is no confusion here, below is a real Newmar schematic diagram I found which somehow got on to the internet. 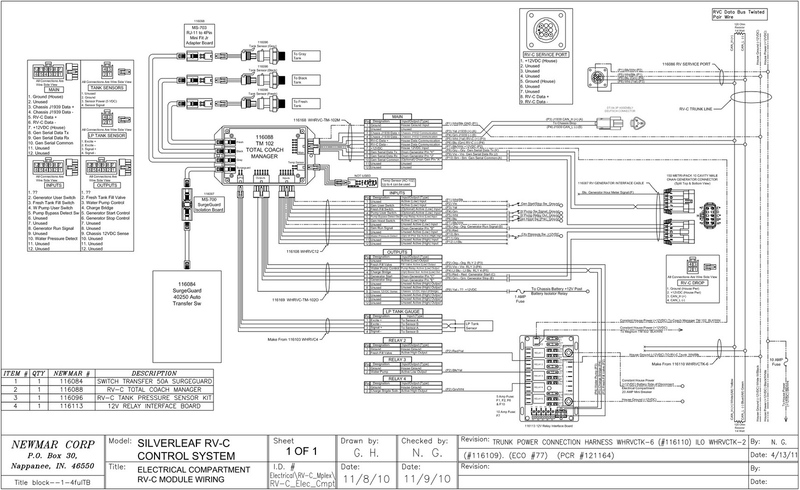 It shows the detailed wiring schematic associated with what appears to be a 2012 King Aire SilverLeaf TM102 module. This is the kind of detailed information owners and owner's choice of service technicians need to service the modern Newmar coaches. Not to have this information will result in much more expensive troubleshooting and repairs for broken Newmar coaches. As owners of these machines we have a right to have these documents as well as associated documents to service other systems on board. Not to have these documents will significantly increase the cost and inconvenience of ownership. Why is this so very important? Newmar field service is an absolute mess. You currently have to wait at least 6 months to get an appointment for service at the factory in Indiana (not a choice for me in California). Many Newmar dealers will not even service a new coach unless it was purchased at the dealership. But most importantly, many of the local Newmar servicing dealers are over subscribed and under resourced to care for these coaches. Our only choice is to seek third party service for competent and timely repairs of these coaches. We must have the proper documentation to allow service technicians not part of the Newmar ecosystem to service our coaches. A NOTE TO iRV2 MODERATORS. YOU SHOULD MAKE THIS THREAD A STICKY ON THIS FORM. THERE IS NO OTHER ISSUE SO CENTRAL TO THE COST AND INCONVENIENCE OF OWNERSHIP THAT THE RIGHT TO GET THESE MACHINES SERVICED IN A TIMELY AND COST EFFECTIVE MANNER. Thanks for the post and in recap of your Statement , I also confirm there is no such thing as “Free Wiring”or anything of that nature with a Smart coach like the New Aire. The term Free Wiring is a term used with 15-20 rolls different color and gauge wire and the tech pulls different lengths to wire the vehicle. This is not happening with any Newmar coaches. In fact most of the wire harness on the New Aire is from a 43 foot King Aire which is why we have tons of extra wire sitting behind our panels. Thanks Mike. Not sure what is going on in the mind of a typical Newmar owner. This is such a significant issue that weaves it's way through so many of the posts on this forum with the pleas for help. When you cannot get a straight answer to a simple question like "how to do you determine the right fluid level in the HWH system", we have a problem. Wake up Newmar owners. Newmar field service is awful and Newmar is making the entire problem much worse by withholding documentation. FYI. I know some of you appear to have responsive Newmar service centers near you. That is great. So in some parts of the country things may not be so bleak for Newmar field service. But of the 62 or so Newmar service centers it is my understanding only a subset are equipped and able to service higher end, more complicated Newmar coaches. That leaves large areas of North America with few if any field service options. I happened to be located in a severely under served area of the country. I have an over subscribed, under resourced dealer in my area who clearly does not like to do service work.